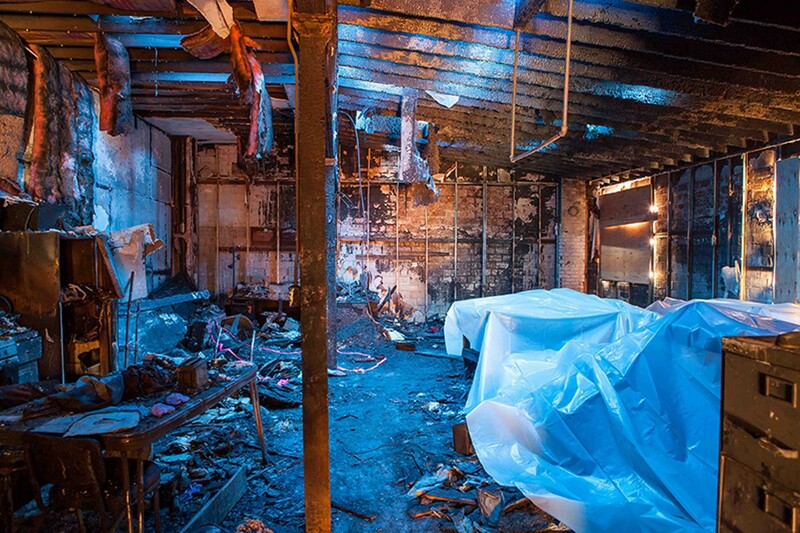 After a fire in a live-work building on 24th Street killed two people, city officials say the landlord has failed to take basic steps to rehab people's homes, and tenants worry that they may be permanently displaced. Tenants worry that the landlord of 669/671 24th Street may use the fire as an opportunity to launch long-term renovations aimed at attracting higher-paying tenants in the future. At around 3 a.m. on the morning of March 21, Amanda Bailey awoke to flashing lights outside the second-story window of her West Oakland apartment. Fire trucks were outside her building on 24th Street near Martin Luther King Jr. Way. Firefighters then rushed to a unit on her floor and pried open the door. Black smoke poured into the hallway. Bailey, her partner, and their third roommate ran out of the six-unit brick building — but for her two neighbors in the unit engulfed in smoke, it was too late. 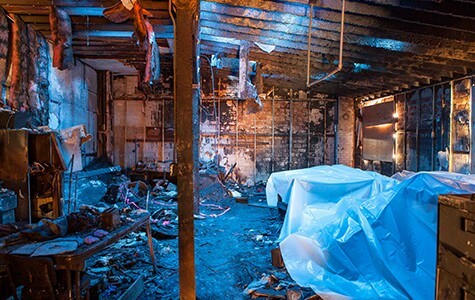 Two artists, Davis Letona, 27, and Daniel "Moe" Thomas, 36, died in the fire — and dozens more residents were displaced from the live-work building at 669/671 24th Street and from an adjacent building — which also suffered damage — at 674 23rd Street. In the 23rd Street building, two well-known publishing organizations — AK Press and 1984 Printing — were also displaced. Officials said it appeared that that the three-alarm fire was accidental and started by someone who was smoking in the unit in which the fire broke out. In that building on 24th Street, the initial inspections suggested that the fire was mostly contained to the single unit, although other units suffered from some smoke and water damage. Bailey and several 24th Street tenants said they were grateful to make it out alive. But they also said that the last month has been a nightmare that they never could have anticipated. Kim Marienthal, property owner of 669/671 24th Street, has failed to take basic steps to help tenants, has done little to assess the damage, has not started rehabbing the building, and has yet to comply with a range of requests made by city officials, according to tenants and documents of Marienthal's communications with the residents and the city. Tenants also said that, in the immediate aftermath of the fire, Marienthal, a Berkeley-based broker with the real estate firm Coldwell Banker, told them they should expect to be displaced for at least a year — even before he or city officials had made any determinations about the extent of the damage. "What we want most is to return to our homes, and we fear you may not want the same for us," the 24th Street tenants wrote in an April 5 letter to Marienthal. Residents said in interviews that it appears that Marienthal has been primarily focused on insurance matters and has not taken a number of critical steps needed to begin fixing the damage at the property — even after the city's building services department sent him a detailed list of tasks to complete — raising concerns that he could be using the fire as an opportunity to launch long-term renovations aimed at attracting higher-paying tenants in the future. "We have a right to move back in at the same rent," said Bailey, who received a text message from Marienthal the day after the fire — which she shared with me — which said: "You should get your belongings out and find new place to live as it may take a year to repair [the] building." "My first reaction was, 'Oh my god, we have to find a semi-permanent place to live,'" Bailey continued. "But my second thought was, 'This guy is trying to get rid of us and not explain to us our rights.'" Her partner, Jordan Glenn, added: "I was stunned. ... The first thing he's saying is, 'You guys won't be able to come back for a very long time.'" In a lengthy phone interview last week, Marienthal defended his actions, saying he has done everything he can to start repairing the damage and said his tenants are underestimating the amount of work that needs to be done. "I feel very sorry for them. I'm doing the best I can, but it's just a horrible situation," he said. But city building officials said last week that Marienthal has not yet taken the initial steps they requested of him after the fire — which tenants and city officials said was in clear contrast to the immediate actions of the landlord of 674 23rd Street, Jux Beck, who has been proactive about launching renovations and communicating with residents. Timothy Low, the city's inspections manager with the building services department, shared with me a March 30 letter that his office sent to Marienthal outlining measures the landlord needs to take to restore the building. That includes hiring licensed professionals to write plans to rehab the building's structural systems, mechanical and electrical systems, plumbing, and other functions that may have been disrupted. The city, after reviewing plans from architects and engineers, would then issue construction permits, the letter explained. At 23rd Street, Beck has hired architects and engineers and has already started acquiring the city permits he needs to begin preliminary construction work, according to Low. "On 23rd Street, we have some actions," he said. 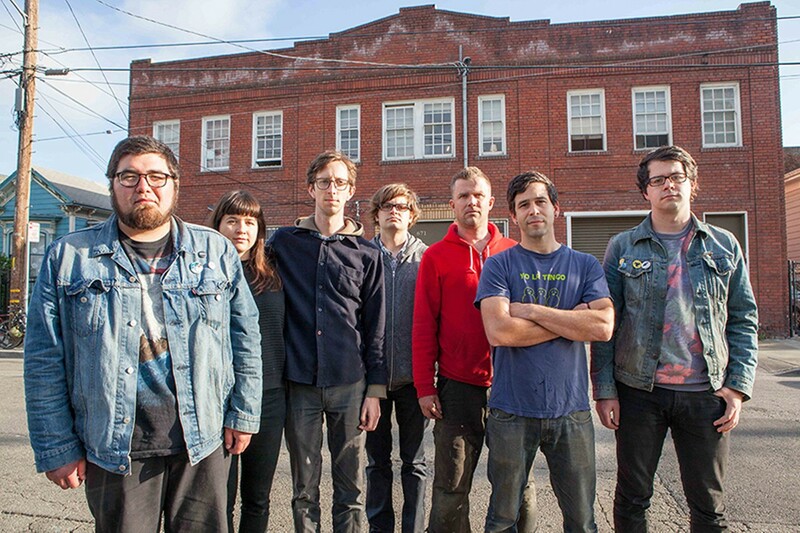 "We're nowhere near occupancy yet, but at least we have started." But so far at 24th Street, Marienthal has only brought in a consulting engineer to issue an initial report on the damages. That report, a copy of which Low provided to me, offers a preliminary assessment based on visual observations, but doesn't address any short-term or long-term construction needs. The hired engineer cited significant damage in the roof rafters, the beam that supports the roof, and the roof and floor sheathing, but said that four of the six units in the building remain "structurally safe." Those units, however, suffered from water-related mold, electrical problems, and a lingering "sooty" smell after the fire, raising questions about habitability, the letter said. Jonah Strauss — a 24th Street tenant for eleven years who ran his music studio, Shipwreck Recording Studio, out of his first-floor, live-work unit — took me inside the damaged building last week (after the city approved limited access for tenants to remove possessions). In his unit, which is partially below the one where the fire ignited, there's smoke damage in his bedroom, but other areas of the apartment appear less affected (though water damage impacted some of his walls and destroyed a lot of his recording equipment). Another first-floor unit next to his has no visible damage. Upstairs, the air quality is poor from the fire, and one unit I visited suffered smoke damage and a broken skylight. The unit where the fire occurred is covered in black soot throughout and clearly requires a massive reconstruction. Strauss said Marienthal has brought an insurance adjustor to the building on multiple occasions, but has yet to bring out construction contractors. "He's prioritized that heavily over the needs of the city," he said. "The city told him what to do weeks ago. It's unfathomable." Beck, the landlord at 674 23rd Street, told me that he has hired roughly fifteen professionals and contractors to start doing evaluations and preliminary construction work. He said he also helped pay for initial relocation for some tenants who needed aid. "The fire had just been put out, and he was already trying to figure out who didn't have places to stay," 23rd Street resident Jose Palafox said of his landlord. "And he's just been really on top of meeting with the city." Palafox said he feared that the disruption the fire has caused to the artist communities in the two buildings could be worsened if the 24th Street property owners used the disaster as an opportunity to convert the building into market-rate housing for wealthier residents. "It pains me to see the other building that went through this really tragic incident ... now having to deal with even more trouble," he said. "It just doesn't seem like their landlord is trying." Mike Walti, a 24th Street tenant who also ran a music studio, Wyldwood Studios, out of his first-floor unit, said that he ended up staying at his apartment without water or electricity for two days after the fire because Marienthal had done nothing to help them ensure their belongings were protected from possible looters. "This guy was basically nonexistent," Walti told me. "He just said get your stuff and get out." Bailey told me that Marienthal had initially offered to help tenants pay for temporary relocation immediately after the fire — but never followed up. Marienthal said in an interview that he had told tenants that insurance might help cover relocation or temporary housing costs, but that he found out later that was not the case. Regarding the city's requests, he said he recently scheduled appointments to meet with engineers and contractors, but added: "It's still going to be a ways off until I can hire a contractor to start rebuilding." He also said it could take months to secure a settlement with his insurance company and that there's little he can do before that happens. "My major concern is to get the place reconstructed as soon as possible," he said, adding, "I'm not a slumlord who is out for a quick profit. I'm very sympathetic to my tenants." Low said that the city is obligated to give Marienthal time to work out finances with his insurance company, but added: "He cannot drag his feet for too long."